In the 14th century there was only one settlement in the Saas Valley: Saas. Four villages arose out of Saas and now they are known as «The Pearl of the Alps». 13 four thousand meter peaks surround the ski resort, which is located at an altitude of 1800 meters above sea level. This place is quite deservedly considered to be the most beautiful corner of the globe. Here you can find 350 kilometers of thematic and hiking trails as well as 150 kilometers of pistes of all levels of difficulty. Twenty-two railways lead to the pistes, and among them is the well-known Metro Alpin, which takes passengers to the world's highest revolving restaurant. Why should I go there this winter? A ski instructor Fabian Zurbriggen will help you to answer this question. Could you tell a little about the location of the resort, its sights and natural peculiarities? Saas-Fee lies in the south of Switzerland, close to the Italian border, in midst of some of the highest peaks of the Alps, the mount Dom being the highest mountain wholly in Switzerland and the third highest in all the Alps. In Saas-Fee, we have a strong affection for the mount Allalin, a princess of eternal ice and snow, overlooking Saas-Fee from above in its graceful stature. I love her! Our village is embedded in those high mountains and surrounded by larch and pine forests and by glaciers; the mountain range builds a natural amphitheatre. This unique and striking scenery gives Saas-Fee its special ambience and makes it one of the most beautiful spots of the world. Then, already at the level of the village, you turn a corner of rock and suddenly meet with a sight such as I have never seen anywhere else. You are standing at the end of the world, and simultaneously at its origin, at its very beginning, and in the middle of it. An arc of snowy peaks arranged in inexpressible harmony frame the horizon toward the south, while on the west loom a chain of Gothic spires. At first you can do nothing but look up; it takes your breath away. I highly recommend to come and convince yourself! What about the history of this resort? Saas-Fee looks back on a history as a travel destination of more than 150 years, starting with alpine climbers from mainly Great Britain in the early days. Our former village priest Johann Josef Imseng encouraged the local people to open up for tourism and contributed intensively to its development. He is also seen as the first skier in Switzerland, skiing down to Saas-Grund on two wooden planks already in 1849. So, it’s no wonder that some of the most successful ski champions of Switzerland, like Pirmin Zurbriggen, come from this valley. It’s a fantastic place to ski and snowboard, and the local ski teachers will happily share their rich experience and high skills of skiing with you. 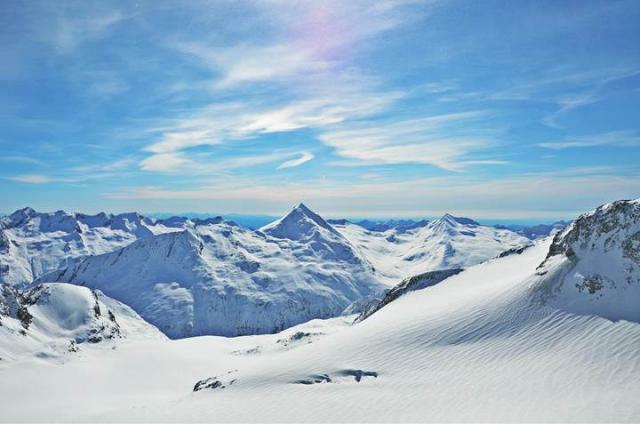 What are the characteristics of Saas-Fee’s ski area? A characteristic of the Saas-Fee ski area is the high altitude; there is a big variety of pistes, coming down from 3’600m above sea level down to 1’800m. Some pistes are on the glacier, there are mogul runs and also challenging off-piste areas. Beginner’s slopes are in easy reach just aside the village. You have access to all the pistes in the Saas valley and will find suitable slopes for all needs. To reach the top you take the Metro Alpin, the world’s highest underground funicular, up to Mittelallalin. Below the mount Allalin there are wide flat pistes in a spectacular glacier scenery, you can carve your track into fantastic snow. My preferred ski area is Plattjen, where you can ski off-piste and find your way through the pine forest, go for moguls and jumps and enjoy black and yellow runs, and there are also blue and red pistes. Kreuzboden-Hohsaas, the ski area above Saas-Grund, gets lots of sunshine and attracts skiers at all levels. From there you will enjoy a fantastic view of the Mischabel mountain range. Saas-Fee is well known for its extraordinary snow quality and a very long ski season; you can ski from the top all the way down to the village from late autumn till mid-spring time. Also in summer you can enjoy skiing on our glacier pistes. Over the entire year one can count 300 sunny days. In the Saas valley ski area you will find great conditions for skiing, in 2012 it was chosen best ski resort of Switzerland by European customers in a customer satisfaction survey! What facilities are there for freestyle skiing and snowboarding? And what do you recommend to those interested in freeriding and off-piste skiing? There is a fun park at Morenia, you can slide on rails and boxes, and try out jumps of different sizes and forms. In summer time the fun park is at Mittelallalin; rails and boxes, a half pipe, kickers and jumps will await young fellows looking for excitement. Freeriders may enjoy fresh, dry and light powder snow several times a year. There is a big off-piste area easy to access. For those who want more, I’d recommend to hire a mountain guide who will bring you to untouched snow fields in the mountains or may accompany you to heliskiing. What does the resort offer for families? A few hotels offer childcare and special programs for children. The Swiss Ski School also offers daycare for small children. Nearby the village children can play in a ski park where they can make their first skiing experiences. Besides, there are other sports, activities and events children may participate in like snow tubing, sledging, baking bread and pizza or dancing at the children disco. How does it work with the ski schools? What kind of lessons and programs do they offer? There are several ski schools in the valley. We offer group lessons and individual lessons, for children, youth and adults, at all levels. You may entrust your child to our well experienced ski instructors and give skiing a first try at an early age of 3 years. Every week new groups of different levels start their classes, so you may join the group fitting best to your skiing skills. Not only as a beginner, but also as a well experienced skier you may be challenged in our ski classes and learn new techniques and skills. Did you know that the technique for moguls may also be helpful in powder? The ski instructor will make you familiar with the ski area and show you the best spots for your skiing pleasure. A ski run at night by ski instructors holding a torch and other spectacles will make your winter holiday an unforgettable event. At the end of a fulfilling and exhausting day of skiing, what would you recommend to do? You may certainly have a drink at one of the bars nearby the pistes and indulge into apress-ski. In our cozy little village you will feel comfortable at once. Our car-free resort invites to stroll along the streets, admire the old traditional barns, find out more about the history at the Saas museum, and last but not least, give yourself a break at one of the many spa facilities. Our sport shops will provide you with all you need for alpine sports and assist you with good advice. Also local foods and souvenirs are available at our shops. How do I best get there? You may head for one of the airports in Milan, Zurich or Geneva, from where you get within about 3 hours to Saas-Fee by public transport means. The trains to Visp are fast and convenient; from Visp you take the PostBus going through the Saas valley. There are frequent connections. If you prefer to drive yourself you may either choose to drive along the Rhone valley from Lausanne uphill, coming from Berne you entrain at Kandersteg and enter the canton Valais through a tunnel or you may come from Italy and cross the Simplon pass to arrive in Valais. There are available the citizen pass and the Saaspass for all citizens of the Free Republic of Holidays Saas-Fee. Citizen pass is included into the room rate from the first overnight in all participating hotels and apartments. The pass entails plenty of benefits, either free of charge or at special prices. For instance, you can use the PostBus within the Saas valley free of charge. Citizen pass holders can also purchase a Saaspass for CHF 5 (CHF 2.50 for children between 6 and 16) per person and night. Until the age of 6, Saaspaas is free of charge. Saaspass holders get even more benefits, for example reductions on the skipass.